To begin: ground yourself in the here and now. You already live in a bioregion. Manifest it to yourself by exploring the land around you. Wander, discover, get lost, awaken to what is around you. Use your feet to do it; it’s what they are for; it’s what you are for. Garden: as well as crops, collect seed from plants that happily grow around you and introduce them into the spaces that you tend. Intend, tend what is around. You have set off on what is to become your own personal saga of local connections. You start to reach out to all the life that is around you. Meet the animals and insects that share your bioregion with you. You make friends with your neighbours and start working on joint projects, projects that give you a sense of satisfaction and conviviality. You spend less time driving and sitting in front of a computer screen in search of worthwhile connections. The connections grow, helping create more connections. Like the plants around you, you begin to grow. Time to celebrate all the abundance! Make up your own rituals. We are all shamans-in-waiting. As we get more grounded, as we spin our web of local connections, as we celebrate the abundant treasures of our land-and-sea scapes, we come home. We belong once more. We have found the antidote to alienation. Remember: bioregioning’s an invitation, not a doctrine. This is the only route through to you that I can find at the moment. We were in touch over a year ago when I was contemplating organising an Introduction to Permaculture weekend here on Arran. That fizzled out because I became hugely involved with the launch of the Eco Savvy Community here – but through Eco Savvy we are now about to have access to some community land, and wish to invite a teacher to run an Intro weekend to help us start our thinking. Is this work you are still doing and might you be interested? If not, is there another teacher you could suggest? I am very hopeful that this will be the next step in an amazing community project. A VERY interesting webpage and work that you are doing! “Bio-regioning”…reminds me of the extensive “bio-geographical” survey of Afghanistan, which I attempted, during my Lancs Uni. Certificate studies, in preparation for being deployed to Kandahar, as a Meteorologist. An exceptionally data-sparse part of the world, unless you are able to read Russian or Iranian textbooks! Lol. 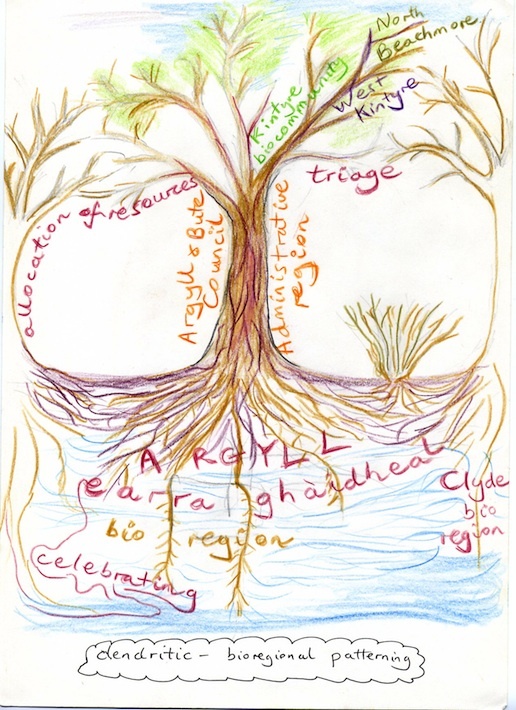 I look forward to working, with your guidance, on my Permaculture Diploma and exploring my own “bio-region” around Lossiemouth and the Inner Moray Firth.